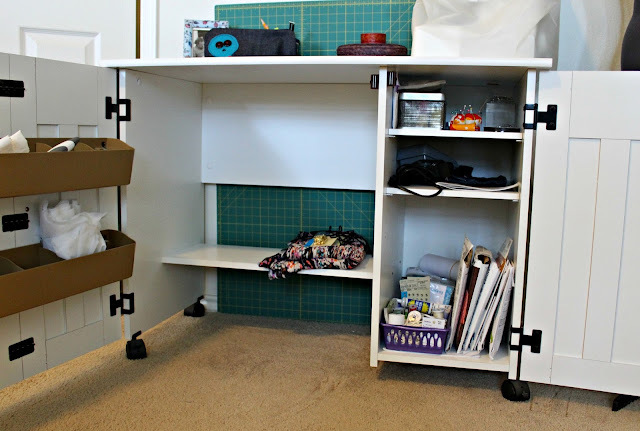 something to mainly store sewing things and wasn't easily accessible to the kids. So after a little thought, taking measurements and scouring the internet I came up with this set up. I like it and it suits me well for now. 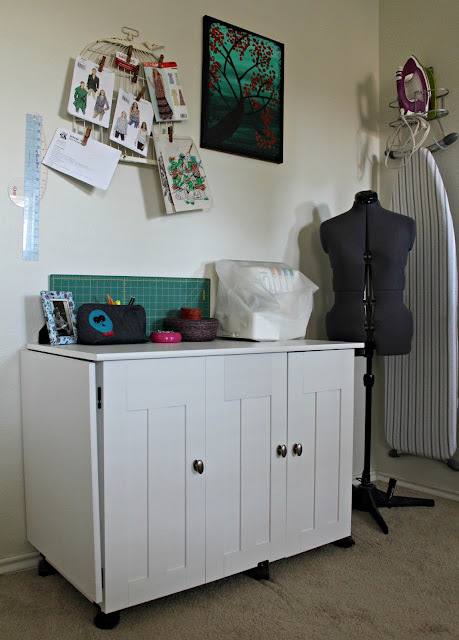 I love my sewing table - I found it at Walmart.com. It has lots of great storage and a place to hold my serger. I love my ironing board hanger which was just mounted on the wall over the holidays and my dress form is great too. 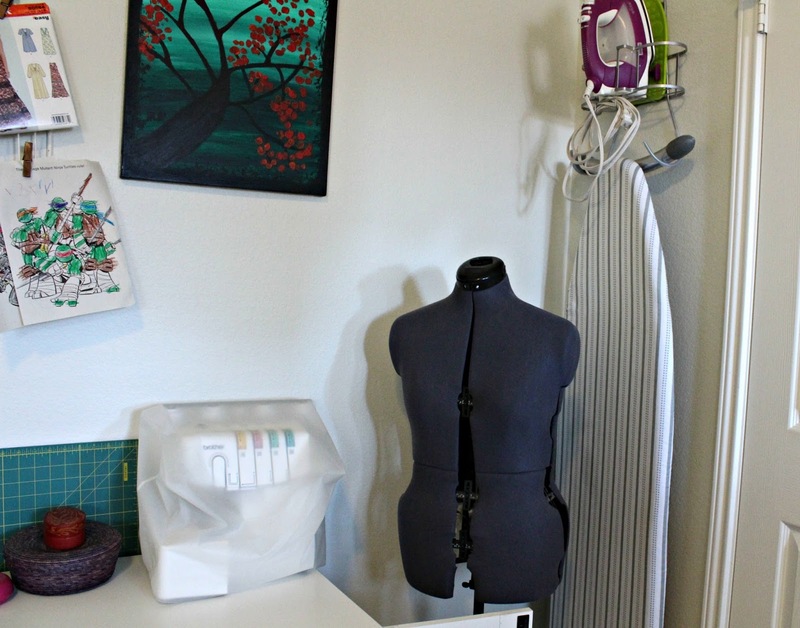 I use everything in this space however I don't do my sewing here. I like to sew at our kitchen table. I have my sewing machine in a corner in the kitchen where is stays stored in its carrying case. I don't mind taking it out when I need to sew; it's easy, fast and stays out of the way when it's not in use. Much of my sewing prep work happens in my sewing space. 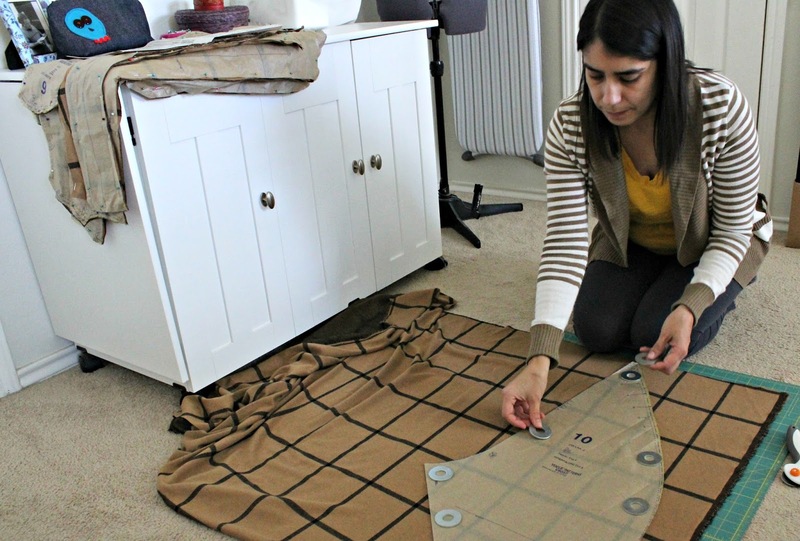 I have a cutting mat that I put on the floor and when it's not in use I tuck it behind the sewing table. I set up my iron and ironing board right next to my sewing table and all of my tools are in that cute denim pouch with the skull on it. I just got a really nice wall mirror for Christmas that I can't wait to hang then everything should be complete. Thanks for sharing your sewing space solutions! We have a small home and I have taken over a large close and a corner of our really big main living area so I totally relate to your making a smaller place work for you! 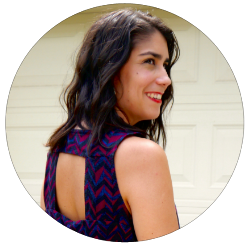 I have enjoyed reading your blog, very inspiring!